Chrysanthemum coronatium L., Sp. Pl. 890. 1753. Chamaemelum coronarium (L.) E.H.L.Krause in Sturm, Deutschl. Fl., ed. 2. 13: 203. 1905. Chrysanthemum coronatum Dum.Cours., Bot. Cult. 2: 446. 1802, nom. illeg. Dendranthema coronaria (L.) M.R.Almeida, Fl. Maharashtra 3A: 97. 2001. Glebionis coronaria (L.) Tzvelev, Bot. Zhurn. (Moscow & Leningrad) 84(7): 117. 1999, comb. superfl. Glebionis coronarium (L.) C.Jeffrey, Mansfeld's Encycl. 4: 2092 (2094; 6: 2826). 2001, comb. superfl. Matricaria coronaria (L.) Desr. in Lam. & al., Encycl. 3: 737. 1791. Pinardia coronaria (L.) Less., Syn. Gen. Compos. 255. 1832. Xanthophthalmum coronarium (L.) P.D.Sell in Sell & Murrell, Fl. Great Britain & Ireland 4: 556. 2006. Buphthalmum oleraceum Lour., Fl. Cochinch. 2: 506. 1790. Chrysanthemum breviradiatum DC., Prodr. (Candolle) 6: 64. 1838. Chrysanthemum coronarium subsp. discolor (d’Urv.) Rech.f., Beih. Bot. Centralbl. 54B: 634. 1936. Chrysanthemum coronarium var. concolor Batt. in Battandier & Trabut, Fl. Algérie 1(3): 462. 1889. Chrysanthemum coronarium var. discolor d'Urv., Mém. Soc. Linn. Paris 1: 368. 1822. Chrysanthemum coronatium var. spatiosum L.H.Bailey, Gentes Herb. 1: 47. 1920. Chrysanthemum coronarium var. subdiscolor Maire, Bull. Soc. Hist. Nat. Afrique N. 29: 2481 423. 1938. Chrysanthemum merinoanum Pau, Actas Soc. Esp. Hist. Nat. 28: 215. 1899. Chrysanthemum roxburghii Desf., Cat. Pl. Horti Paris. ed. 3, 170. 1829. Chrysanthemum senecioides Dunal ex DC., Prodr. (Candolle) 6: 64. 1838. Chrysanthemum spatiosum (L.H.Bailey) L.H.Bailey, Man. Cult. Pl., ed. 2, 987. 1949, comb. inval. Chrysanthemum speciosum Brouss. ex Pers., Syn. Pl. (Persoon) 2(2): 463. 1807. Glebionis coronaria var. discolor (d'Urv.) Turland, Taxon 53(4): 1073. 2004. Glebionis roxburghii (Desf.) Cass. in F.Cuvier, Dict. Sci. Nat., ed. 2. 41: 41. 1826. Glebionis roxburghii (Desf.) Tzvelev, Bot. Zhurn. (Moscow & Leningrad) 84(7): 117. 1999. Pinardia roxburghii (Desf.) Fisch. & C.A.Mey., Index Seminum [St. Petersburg] 3: 44. 1837. 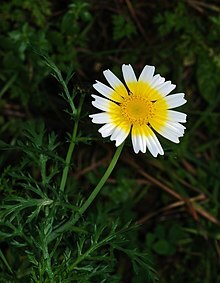 Pyrethrum breviradiatum Ledeb., Mém. Acad. Imp. Sci. St. Pétersbourg Hist. Acad. 5: 577 (-578). 1815. Xanthophthalmum coronarium var. discolor (d'Urv.) P.D.Sell, Fl. Gr. Brit. Ireland 4: 556. 2006. African Plants Database (version 3.4.0). Glebionis coronaria. Conservatoire et Jardin botaniques de la Villle de Genève and South African National Biodiversity Institute, Pretoria. Accessed: 2012 Aug 16. Spach, É. 1841. Hist. Nat. Vég. 10: 181. The Plant List 2010. Version 1. Royal Botanic Gardens, Kew and Missouri Botanical Garden. Published on internet. Accessed: 2012 Aug 16. Trang này được sửa đổi lần cuối vào ngày 19 tháng 2 năm 2019 lúc 20:28.